The Northland reported an "exciting day of fishing today", catching about 1,400 Sockeye Salmon. Kyle said that the fishing was pretty hot right off at 7 a.m., then slow most of the day and then strong again before closing at 7 p.m. If the run of salmon comes in strong we can hope for some good back to back fishing in the next weeks. 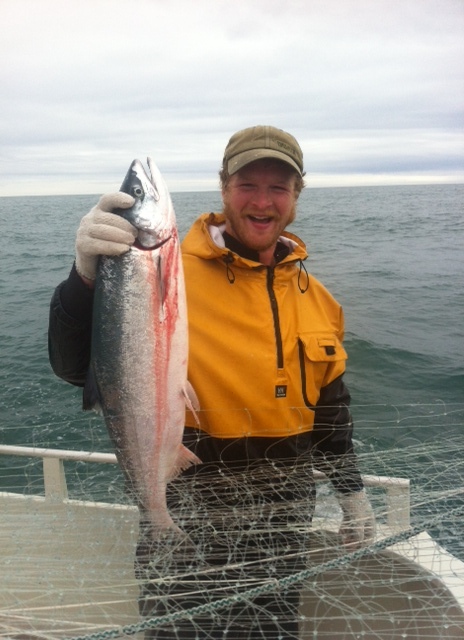 One of the many BEAUTIFUL Kenai Reds and HANDSOME deckhand Jake. A number of customers have asked us general questions over the past years about our drift gillnet fishing operation. Here's an attempt at starting to publicly answer a few of them. Let us know if you have more questions! Length of our boat: The Northland is 32 feet long. Size of our net: Our net is 3 shackels long, each shackel is 50 fathoms and each fathom is 6 feet-- for a total of 900 feet in length. It is 45 meshes deep (diamond shapes of net), each mesh being 5.125 inches high-- for a total of 230.6 feet. However this depth is a little misleading because it is never fully stretched out while fishing. Number of boats in Cook Inlet: There are 600 permits out there and about 400 boats fishing. A boat can double up their permits and be allowed to fish one more shackle and other permits are not fished. Number of Salmon in Cook Inlet: This varies year to year, but last year 6.4 million salmon returned to Cook Inlet. The fishery was regulated for an escapement, or upriver return, of 1.2 million fish. The remaining fish were divided amongst the user groups- commercial (drift and set gillnet), sport and personal use. Number of days we fish in a season: If there are a lot of fish they let us fish more and vice versa. This generally ranges between 16-30 fishing days. Percentage of our catch that we sell directly to customers: Again, it all varies but last year we sold a little under 10% of our catch directly to customers and the rest was offloaded and sold to our cannery. glad you enjoyed the read! tell others about us and try some of our Scrumptious Sockeye Salmon! I was pretty pleased to find this web site. I want to to thank you for your time due to this fantastic read!! I definitely savored every bit of it and I have you saved to fav to look at new things on your site.